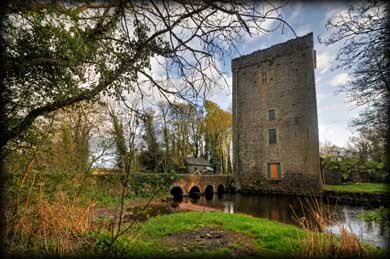 We're not sure if it was the soft evening light, the seclusion provided by the large towering trees, or the sound of the water gurgling downstream in Cloon River, but our visit to this 16th century fortified Norman tower house with a thatched cottage attached was pure delight. The four story castle is simple in design, with one room on each floor connected by a spiral stone stairway built into the seven-foot thick outer walls. Each floor has a single window overlooking the river which flows along the north side. Not much about its early history is known other than that it was built by the family de Burgo, or Burke, Earls of Clanrickarde. In 1902 it became part of the Coole Estate, home of Lady Gregory, who hosted the Irish Literary Revival which included the likes of George Bernard Shaw, W. B. Yeats and J. M. Synge. Yeats was so enchanted with the property that he purchased it, married, and began to restore the castle to use as a summer retreat for his new bride. Although he installed larger windows in the bottom floors he didn't alter the structure in any way, keeping the internal stone walls whitewashed and rooms furnished minimally with furniture from local craftsmen. 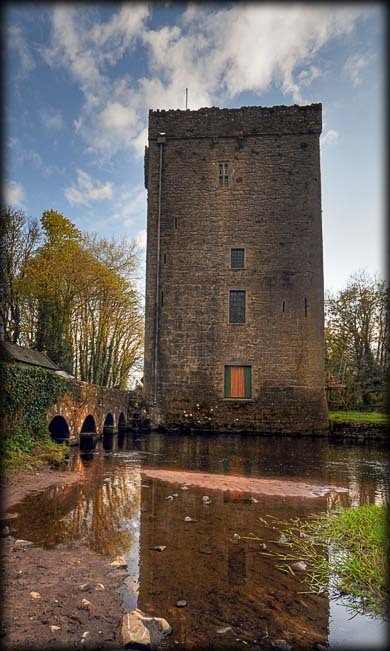 He dropped the word "castle" in favor of "Thoor" - the Irish word for tower, and he was inspired to write his poems “The Tower” and “Coole Park and Ballylee" there. The family abandoned the property in 1929 and it fell into ruin until 1965 when it was restored as Yeat's home and museum; the cottage is a tea room and shop. Unfortunately the castle and shop were closed when we visited due to flood damage that occurred two years previously. We read that it may be open again in summer 2012 but we recommend checking before visiting if you would like to enter the tower. Situated: From Gort head North on the N66 towards Loughrea. 5 kilometres turn left For Thoor Ballylee (Sign-posted). The Tower is 1 kilometre down this road. Discovery Map 52: M 4811 0612. Last visit April 2012.